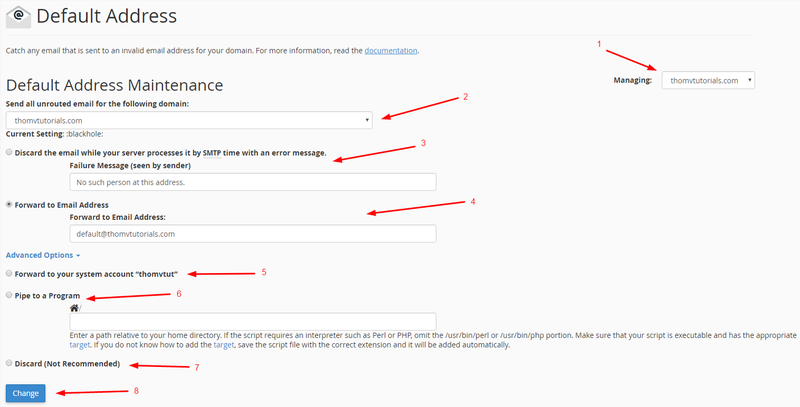 In this simple tutorial, you will learn how to set up a default email address for your domains. That is done using implemented cPanel’s Default Address feature. Default email address is used to receive all incoming emails in case the sender is using an invalid email address. For example, I have set up one email address for my domain: admin@thomvtutorials.com, but the sender accidentally writes administrator@thomvtutorials.com instead. Now since such email address does not exist, using Default Address feature that I have set up for such cases will ensure that emails end up in default@thomvtutorials.com. IMPORTANT! It will only work as long as a sender is using a correct domain name, in our case: thomvtutorials.com. Also, you must have a default email address created beforehand setting it up using Default Address feature. After clicking on Default Address, you will be taken to the next window which looks something like we see in the following picture. Here, you will see all the options marked with arrows with numbers. They will all be explained below the picture. Managing – Here you must choose which domain name you want to manage Default Address for, you can either choose a specific domain/sub-domain/addon domain or keep the All Domains option so that all unrouted emails coming to any of the domain names which exist on your cPanel account would be routed to the default email address. This option does exactly the same as the first one. So you can simply choose the same thing you chose in the first option. With this option, you can choose to discard the incoming email and send an automatic reply to the sender which may say whatever you write in the Failure Message section, in our case: “No such person at this address.” would be sent. Forward to Email Address option is the one we will be using and the one we recommend using. Here you must write the email address to which all unrouted emails will be going to. In our case, we chose to catch all lost emails with default@thomvtutorials.com email address. This option will forward lost emails to the default cPanel’s system account. We do not recommend this option as most hosting providers don’t provide full functionality of the system mail account. Pipe to a Program option will let you forward lost emails to your scripts. This is an advanced feature and we only recommend using it if you know what you are doing. Discard – Do not use this option. It will simply delete all lost emails without sending a failure message to the sender. Basically, sender won’t know that the email did not reach you and you won’t know that the sender tried reaching you. Finally, after making your choices, click on Change to save your changes. Congratulations! You now have Default Email Address set up so that all lost and scared emails would find their way to your mailbox and none of them will go unread!